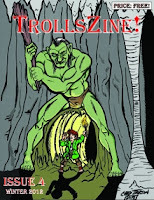 We have another dedicated Tunnels and Trolls fan who is the current editor of Trollszine magzine. Just as it halps to be called Steve Jackson if you want to write a Fighting Fantasy book, it also seems to help to be called Dan if you want to edit a fanzine about Tunnels and Trolls. Dan is a very active participant in the Tunnels and Trolls community - he has his own blog with lots of useful information on playing Tunnels and Trolls and you will regularly posting in Trollhalla and the Tunnels and Trolls forums so there are few more suited to editing a fanzine than Dan. And what's more, he also agreed to do an interview with me! What was the first gamebook/solo you read (that wasn't your own)? Ian Livingstone's "Deathtrap Dungeon" from the Fighting Fantasy series. It was the cover illustration that immediately grabbed my attention on that book. 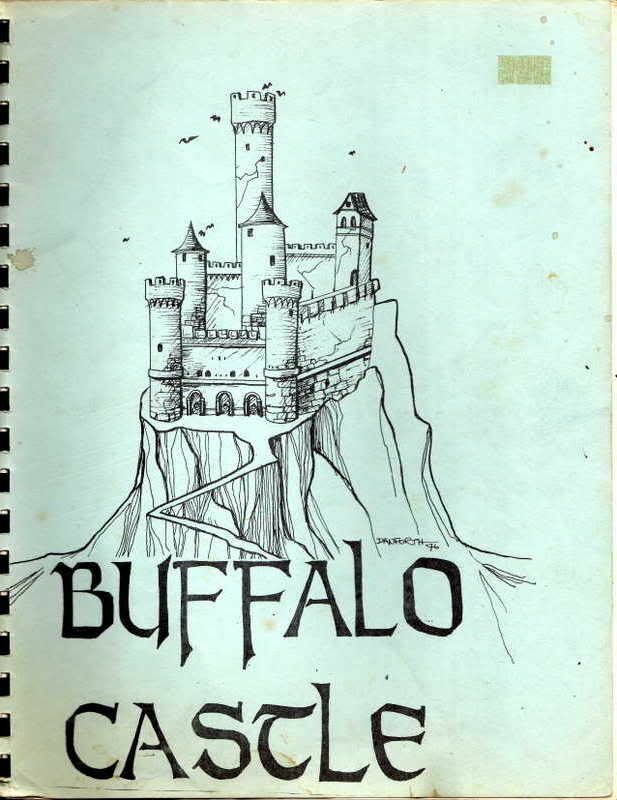 I had read a number of "Choose Your Own Adventure" style books before including the D&D Endless Quest books, but as others have said I do not really consider these to be gamebooks mostly because there were no dice involved. What is your favourite gamebook/solo? "Sword for Hire", a Tunnels and Trolls solo adventure. This was the second T&T solo I played after "Buffalo Castle" back in the late 80s and it is still one that I can play over and over. What gamebooks/solos/interactive fiction would you recommend to a newcomer to the genre? The Fighting Fantasy series. They are great adventures and they stand on their own. After that I'd recommend looking into Tunnels and Trolls and it's solo adventures. Summarise what a gamebook/solo is to a newcomer in 100 characters or fewer. A story in which the reader creates and controls the actions of the lead character along with an element of the random. 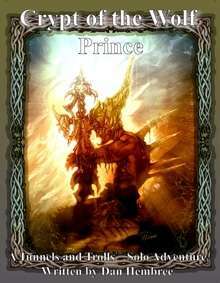 Why are gamebooks/solos great compared to games or books? The interactive aspect makes them great compared to books; you obviously control a large part of the story's outcome with your decisions but then there are also the random elements such as the fall of the dice. This means that you can read them several times often with completely different results. In comparison to most games, you can play gamebooks on your own, which is great for satisfying that gaming itch on short notice. How did you get involved with Trollszine? TrollsZine was started at the TrollBridge in 2010, the online Tunnels and Trolls discussion forum (http://trollbridge.proboards.com/index.cgi), of which I have been a member since 2008. I submitted an article to the second issue and a solo adventure to the third. After that TrollsZine went on hiatus for about a year at which point I stepped in as co-editor of TrollsZine #4 and am now sole editor of issue #5 and beyond. What is your favourite thing about Trollszine? It's FREE! Everyone that submits to TrollsZine, from writers to artists, understands that their work will be offered free of charge to the gaming community. Given the quality and quantity of material in TrollsZine, it's quite an amazing deal. What can people submit toTrollszine? We are looking for a wide variety of Tunnels and Trolls related material including solo adventures, game master adventures, monster descriptions, articles on house rules , short fiction, humor pieces, and of course art. Original art is typically the hardest to get, but we do have some very talented artists in our community. If anyone would like to submit to TrollsZine they should contact me through the TrollBridge. How else can people help out Trollszine? We always need help with editing submissions. When it comes to writing a gamebook/solo, what's the most important thing that you do? Coming up with an idea for an adventure that holds my interest over the long process of writing, editing, playtesting, art production, and layout design. It is a lot of work, especially for one person, so I have to really love the concept to get it all done. What have you got coming up in terms of your gamebook/solo/competition/Trollszine projects? Let's see, TrollsZine #5 is due to come out in May, I am working on publishing a game master and solo T&T adventure from different authors later this year, and (hopefully) another solo adventure of my own. This will be the second in the solo sandbox series I began with "Crypt of the Wolf Prince" in 2011. Do you have any other sites/blogs/twitter feeds besides http://www.rpgnow.com/index.php?manufacturers_id=2238 ? That is is the RPGnow Flying Buffalo storefront where you can get TrollsZine. My blog is The Lone Delver at http://danhemsgamingblog.blogspot.com/ which covers all aspects of Tunnels and Trolls gaming with a focus on solo adventures. My Tunnels and Trolls solos and related material are sold through my company Lone Delver Games and are available as PDF through RPGNow (http://www.rpgnow.com/index.php?filters=0_0_0_0_0&manufacturers_id=3094) or print-on-demand books through Lulu (http://www.lulu.com/spotlight/danhem35). 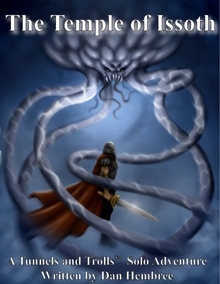 What do you think the future of gamebooks/solos is? In terms of Tunnels and Trolls, I think the future is pretty bright. The pdf market is rather strong and there is an increasing demand of more interactive digital formats. Despite this, in the T&T market at least, there is still interest in good old paper books. The wide variety of print-on-demand publishers makes this option viable for small publishers like myself. So there we go. We have Trollszine 5 to look forward to in May. If you can't until until then, check out Dan's blog, http://danhemsgamingblog.blogspot.com/, take a look at the other four issues of Trollszine and get stuff from Dan's store (some of which, such as the Temple of Issoth is free!) found at http://www.rpgnow.com/index.php?filters=0_0_0_0_0&manufacturers_id=3094 or http://www.lulu.com/spotlight/danhem35. You can also find Dan and other Tunnels and Trolls fans at Trollhalla or The Tunnels and Trolls forum.